Our summer has been amazing and we are really enjoying relaxing and being laid back more than we ever have before. 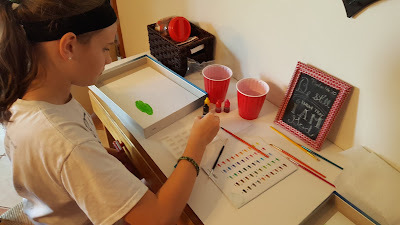 Even though it is summer, we still like to incorporate what I call fun learning especially anything to do with art. Today's review falls into that category perfectly. We were sent the Aquarelle Monet set from Timberdoodle to review. We thought it was the perfect way to pass a hot summer day! 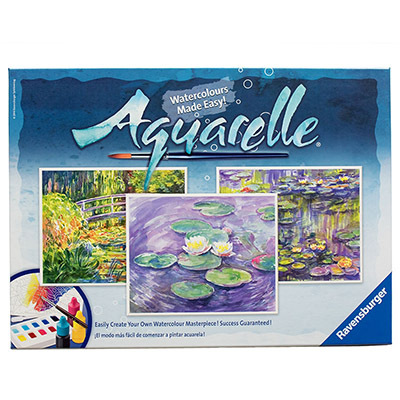 I found myself really interested in the name when I first saw this set and loved the fact that it included landscape scences from Monet's line of water lillies. 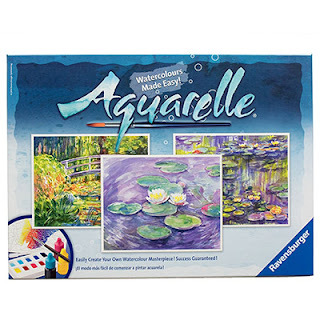 Aquarelle is a style of painting using thin, typically transparent, watercolors. I explained that to my daughter before beginning the fun. Getting started is really simple and easy - all you need is water! 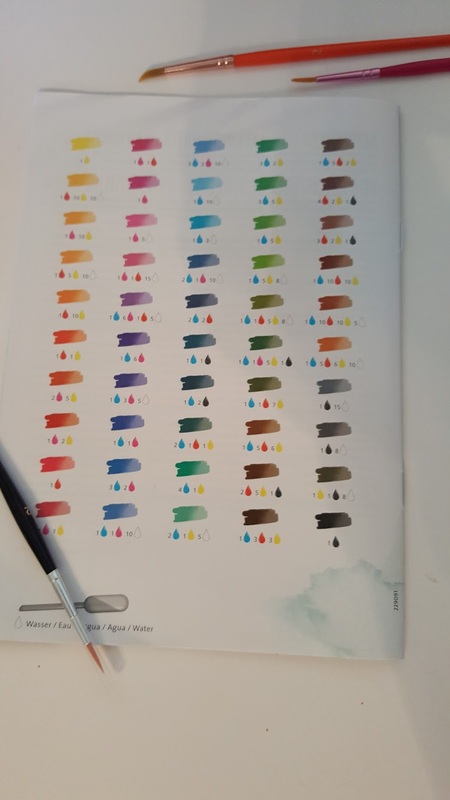 The color mixing guide makes obtaining the color you want even easier. Sarah really enjoyed mixing her own colors using the guide and playing around with her own combinations. The pictures have a wax lining that remains clear as you paint over them giving such a fantastic dimension to your painting and really making it easy to make a great water color painting. Here are some of our finished projects. 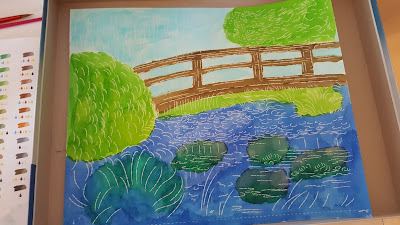 We experimented with adding just a little water to the picture after we finished and liked the effect it left too. It was so fun to play around with - we had a blast making it our own. 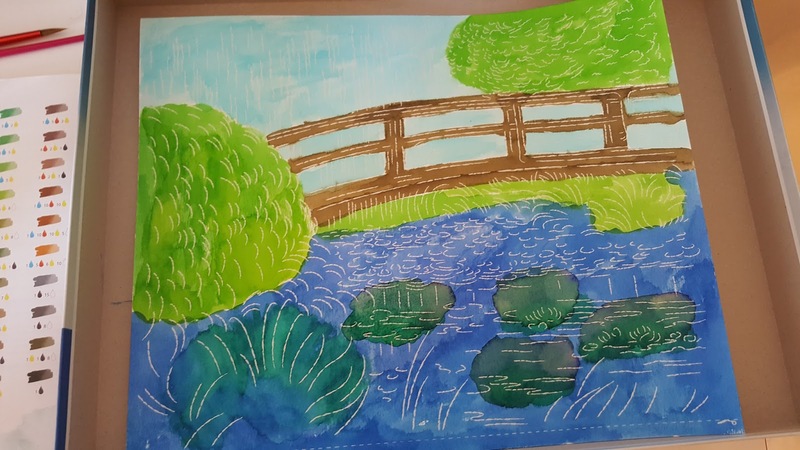 I didn't realize before hand that many of Claude Monet's final and most famous pieces feature the water lilies in Giverny. 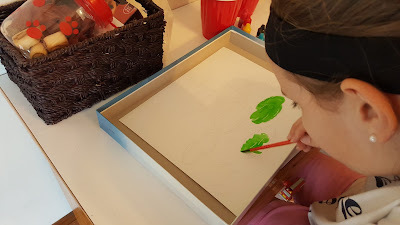 So, not only was this a fun activity it sparked our interest into finding more about the artist as well. 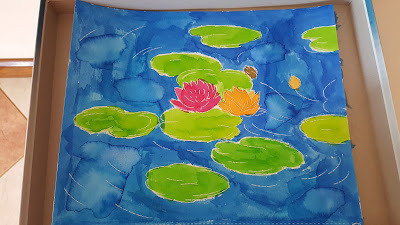 Aquarelle Monet is recommended for ages 8 and up but with a parent's help in mixing the colors I think it would be okay to use with younger children. The great part is the paints are easily washable because we dripped some ourselves as we were mixing and had no problems at all with clean up. We would highly recommend this fun activity! This set currently sells for $28.50 and can be purchased here. This set is also a part of Timberdoodle's 4th Grade 2016 Curriculum Kit.